Hello Friends! Today is the first day of the new 30 Day Coloring Challenge, I hope you've decided to join in, if you do, please leave me your blog address in the comments, so I can buzz by and see what you're up to. I usually take time off from creating during the Summer, but I couldn't resist joining in on another fun coloring challenge. To read more about the challenge please click HERE. Ok. On to today's color share. 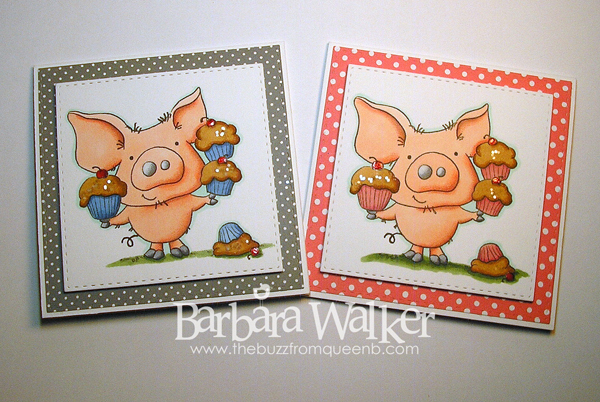 I used a digital image from From the Heart Stamps. I just fell in love with this little pig and his pile of cupcakes. I decided to print two and make one for him and one for her. 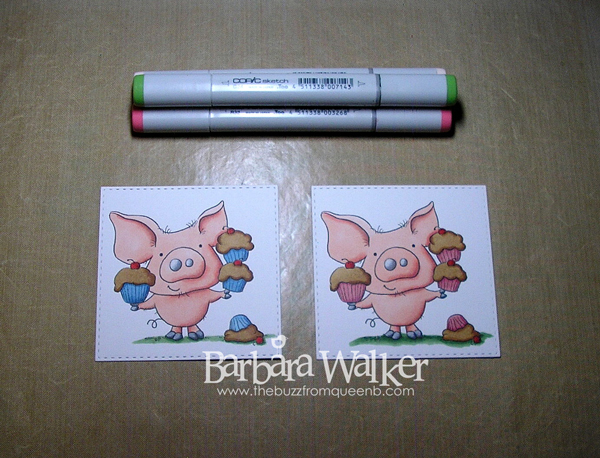 I printed the images onto smooth white card stock and just had fun coloring with my Copic markers. I used my Hex Chart that I purchased from Sandy Allnock to help with my color selections. LOVE that tool! 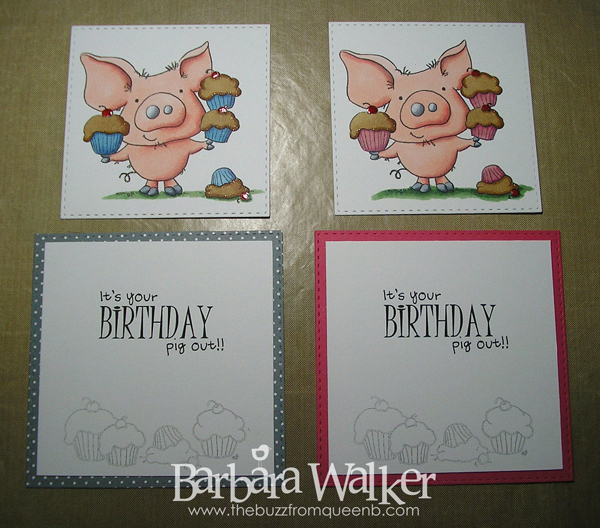 This digital stamp included a sentiment and a row of cupcakes. I printed those off for the inside of my card. I printed the row of cupcakes in gray so that one could still write over it with no problem. Then, I just assembled the cards. I added chunky glitter to the frosting, I wanted it to look like salted caramel frosting and I added Glossy Accents to the cherries. These cards are 4 x 4 in size and I used the Stitched Square dies from Simon Says Stamp to die cut them. So that is it for me today. Thank you for stopping by. I appreciate the visit! Love your coloring!! Hamlet is so cute!! Ha! 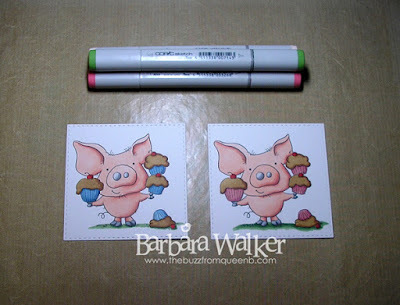 I can see Day 1 was a joy to color these cute little piggies! Salted Carmal indeed! See you around the Challenge Barb! 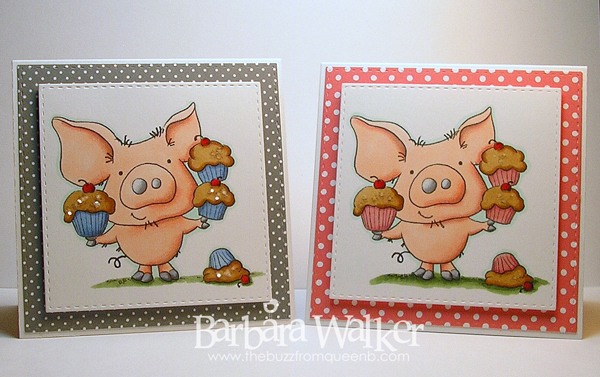 Oooh Barb, I'm sooooo happy to see that you are going to share the Coloring Challenge with us. Your first project is fantastic. What a cute piggie and those cupcakes look scrumptious! Way to start off with a bang. Oh and thanks for the tip about printing off images for the inside of the card in gray. Super idea! Hugs! !